Margaret Bourke-White’s timeless photograph At the Time of the Louisville Flood exposes the farce that is the American Dream. Margaret Bourke-White belongs to the cast of female photographers whose images are ingrained in the collective, American consciousness yet whose names remain little known. Well, you gon’ learn today. Both Bourke-White and Dorothea Lange took photographs that have come to pictorially define the Great Depression. However, just like Migrant Mother, there is a much more specific message embedded within Bourke-White’s photo. As you can imagine, the United States in the 1930s featured some pretty traditional gender roles, and the American public did not expect women to have serious careers in fields like photojournalism and war reportage. But being one of the only woman to take pictures around the world did not discourage Bourke-White. She had plenty of accolades under her belt, including having her own photo studio in New York’s famous Chrysler Building and regularly shooting photographs for feature articles in Life magazine. Bourke-White took her job at Life pretty seriously, and she was no stranger to going to great lengths to get the perfect shot for the popular publication. When Bourke-White received reports that the Ohio River had flooded the city of Louisville, Kentucky, in January 1937, she caught the next flight down south within the hour. When she got to the site of the disaster, she found flooded streets and displaced people. To capture as many compelling images as she could, Bourke-White even sailed along the streets of Louisville in a makeshift raft, putting herself in the midst of the flood. In this infamous photograph, Bourke-White combines the social consciousness of Jacob Lawrence with the straightforward photographic style of Diane Arbus. Bourke-White was quick to notice the city’s social disparities in the wake of the flood, which was one of the worst natural disasters to hit the United States yet. During her stay in Louisville, Bourke-White witnessed this scene of a selection of the city’s people lined up and awaiting help outside of a flood relief agency. 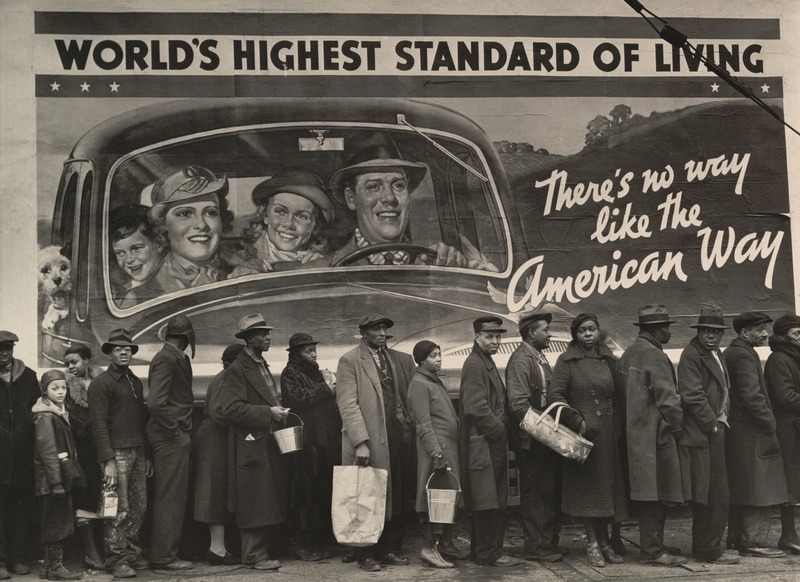 The contrast between the solemn, grief-stricken people in line and the happy-go-lucky family on the billboard has provided one of the most enduring images of the Great Depression, although its true subject has largely remained unrecognized. Abbaspour, Mitra. “Margaret Bourke-White.” The Museum of Modern Art. 2014. https://www.moma.org/artists/712?locale=en. Accessed August 28, 2017. Cosgrove, Ben. “Behind the Picture: ‘The American Way’ and the Flood of ‘37.” Time. http://time.com/3879426/the-american-way-photos-from-the-great-ohio-rive.... Accessed August 29, 2017. Dickie, Chris. Icons of Culture: Photography. The 50 most influential photographers of all time. London: Elwin Street Limited, 2009. Whitney Museum of American Art. “The Louisville Flood.” Collection. http://collection.whitney.org/object/8061. Accessed August 29, 2017.